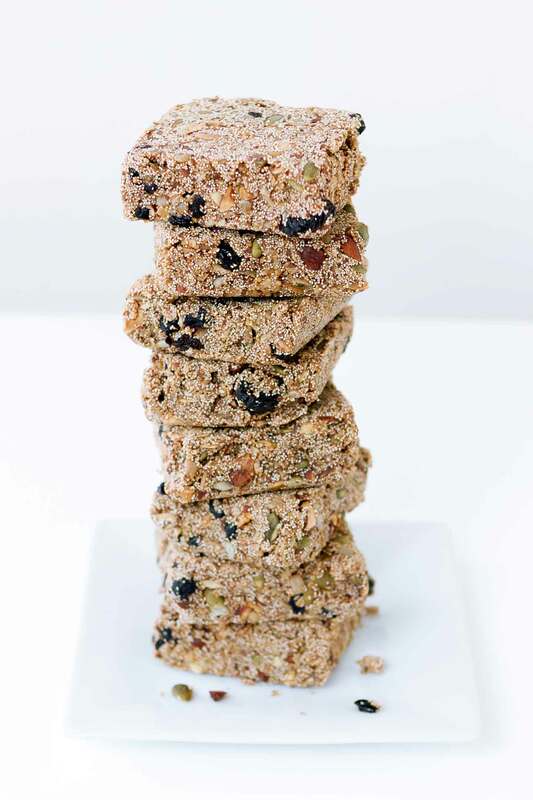 A great homemade alternative to commercial energy bars, this recipe is easily customizable to your favorite nut butter, seeds and dried fruits. Mix teff grain, oats, almonds and seeds together and spread evening on a rimmed cookie sheet. Bake 20 minutes, stirring halfway through for even toasting. Let cool. Mix ⅓ cup water and flax seed meal together. Set aside. Place maple syrup and ¾ cup water in a small saucepan over medium high heat. Bring up to boil, reduce heat and let simmer 2 minutes. In a large bowl combine toasted ingredients, flax meal mixture, hot maple mixture, cinnamon, vanilla and nut butter. Let cool 10-15 minutes. Press into lightly greased pan. Let cool in fridge then cut and store in the fridge or freezer.